Meet our amazing Herbie of the Week, Sarah! 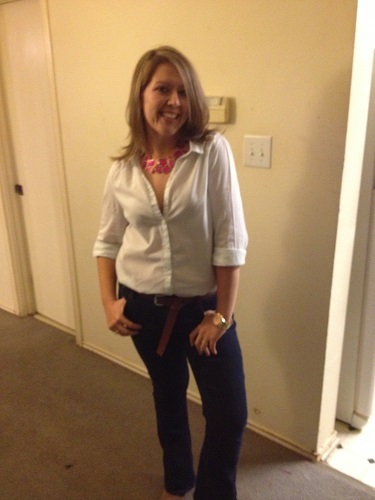 Sarah has lost well over 100 lbs. and was amazed at how easyit was for her to get healthy and happy through a plant-based lifestyle. "This is not a question, this is a THANK YOU! Thank you for your recipes, your blogs, your stories, your meal plans. I adopted a plant-based/vegan lifestyle back in February of 2012. I had been overweight my entire life, topping out the scale @ 290 lbs. When I changed to a plant-based diet, I was at 267 lbs. Your cookbooks did more for me than I could have imagined. They showed me how EASY it is to be this healthy and this happy — on a budget! Thanks to you, I now weight 173 pounds, with about 40 left to go before I am at my goal weight. Also, because of my weight loss, I was featured on HLN Morning Express with Robin Meade as one of their "New Year, New You" inspiration stories. So thank you, thank you, thank you!" I just had to know more, so I asked Sarah if she would be willing to share more details about losing weight and getting healthy as part of our Herbie of the Week series. She agreed, and her response brought me to tears. We are sharing Sarah's inspiring story with you today, in her own beautiful words. "Ooh, long story lol... I have been overweight pretty much my entire life. There are pictures of me from when I was younger depicting a skinny, healthy, playful young girl. I can't pinpoint the exact time when the weight started piling on, but when it did, it didn't stop. Junior high, high school. college — it just escalated. When I graduated nursing school and started out in the ER in 2008, I was around 290 lbs. I was scared to DEATH to go to a doctor at that point — I knew what I would hear. "Sarah, you need to lose weight, this isn't healthy, yadda yadda yadda." I didn't want to hear it. I had heard it enough from my family. Especially my father. My father, for as long as I can remember, was overweight — morbidly obese, to be more exact. His weight had been a struggle since I was a small child. He had high blood pressure and a cardiomyopathy (an enlarged heart). He was on medications for his BP and had tried every diet you could imagine — the Atkins diet, the Cabbage Soup diet. He would lose some weight, it would be great, and then he would gain it all right back. You'd think watching him struggle with his weight for so long and seeing the health troubles it gave him would have motivated me to lose weight, to reclaim my life. Well, it took something much more drastic than that. "This is me and my dad when I was much younger(left)and one of the last pictures I have with him(right), at my nurse pinning ceremony in December 2007. This is the man whose unfortunate and untimely demise caused the radical change in my life. I felt it was only proper to add this." On the day that my father died, September 23, 2009, he was 48 years old. I was 24 at the time, and I had just walked into work to start my shift. My manager was there to meet me in the hallway and pulled me back to her office where I was told the news. I was told that he had suffered a massive heart attack and was instantly gone. There are no words to describe that moment in my life. It's hard for me to remember what was going through my head those next few days, but there is one thought that stuck with me forever — I will never forget. I remember thinking "My dad was 48 years old. I'm 24. If I keep living the life that I am, continue on the road that I am on, I only have half a life left." That single thought scared me more than any doctor, my family, my friends, ever could. To imagine that I could miss out on so much, leave this world so soon. I couldn't — I WOULDN'T — have it happen. Fast forward to 2 years later (yeah, it took me that long to finally get it all through my thick head). For insurance purposes at work and to receive a discount, we had to submit for a health screening, including a weigh-in, blood pressure check, and lab work including a hemoglobin A1C (for diabetics), cholesterol levels, etc. Of course I wanted the discount, but I hadn't had blood work done for YEARS! I didn't want to know what the levels were — if I actually saw them and they were bad, that would make it all real. I figured if I hid from it, the problem would never catch up with me. So I went, begrudgingly, stepped on the scale (270 lbs.! ), let them take my blood pressure (normal, thank God), and let them draw my blood. A few weeks later, I received the results. I can't remember all the numbers, but everything was NORMAL. I couldn't believe it. The way I lived, the way I ate. How could the numbers be normal? Most people would have said "eh, then I'm okay. I don't need to change anything. I'll keep living exactly the way I am." I'm not one of those people. In that moment when I saw those numbers, I heard a little voice in my head say "Sarah, you are only going to go so long on God's good graces before the s*** hits the fan." So that's where the ball started rolling. I knew I needed to do something before it got bad — but what? 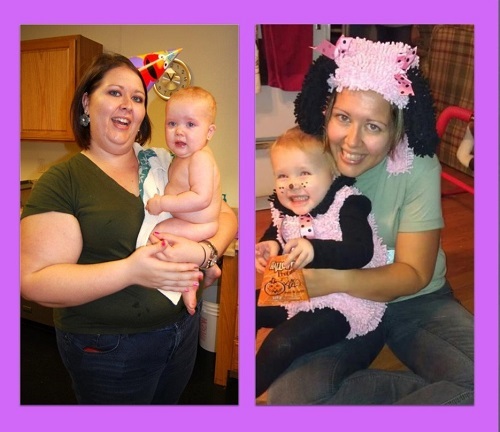 "This is a picture of me with my niece at her birthday party December 2011…This is one of those pictures that I looked at and went, 'How did I let it get this far?'(left). Me with my niece Halloween of last year — what a difference almost a year makes! So happy that I can now be a more positive influence in her life. (right)"
Fast-forward to January 2012. A couple of people I worked with in the ER had recently gone vegan. I myself had entertained the idea of adopting a vegan/vegetarian (once upon a time, a LONG time ago), but thought that it would be too hard (I'm from Texas — we love meat and potatoes! For crying out loud, the majority of my family hunts and eats what they get!). I asked them about it, why they had done it, what motivated them, etc. It sounded good, but I just didn't feel I could commit to it. The one person who finally got through to me was Julie, one of the nurse practitioners I worked with (I'm not sure that Julie realizes that she was the one who helped me start this all!). Julie had always mentioned things to me concerning my health, especially since the passing of my father. I always brushed them off, never paid any attention. I heard her having a conversation one day with one of the radiology techs about a documentary, Forks Over Knives. I was intrigued. "Taken in February while on a visit to Texas." She began to tell me her story — her father had suffered from angina for more than 20 years. 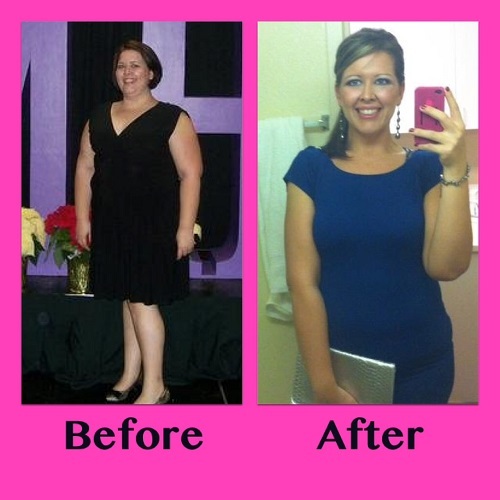 Multiple medications and several diet changes, yet it never went away. Seven months prior, he had read The China Study by Dr. T. Colin Campbell and decided from that moment on to adopt a vegan diet. His angina went away — no more chest pain, no more medications. When Julie saw what it did for him, she decided to give it a try. She told me about how she had never felt better in her life, how she had so much more energy, how she had always thought she was healthy until then. She then suggested I give it a try — she said something along the lines of "For someone with your family history, it's the best thing you could do for yourself." I don't know why her saying it changed my perspective, but it did. In February, I went on one last omnivore bender with a friend from Dallas (figured I would go out with a bang!). I then went back to Austin, cleaned out my fridge, and started on the vegan way. Here I am, officially 116 lbs. lighter and feeling more amazing than I ever have. I strive to inspire those I know and love to adopt a vegan diet, and I actually have some of them giving it a shot, which makes me so happy! I have recommended your cookbooks to every single one of them (and so far, they all LOVE THEM)." 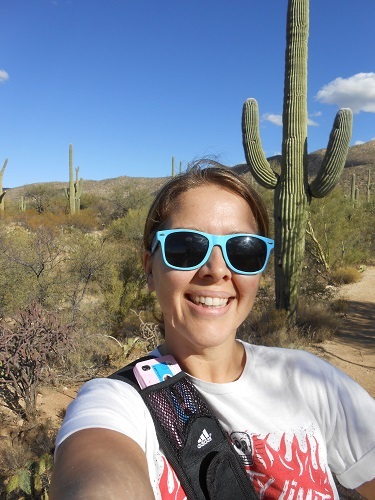 "Hiking in Arizona — something I could NEVER do before." UPDATE (May 22): "Not much has changed since we last spoke. Still living the plant-based lifestyle and reaping the benefits! Down to 164 lbs. at this point — an AMAZING feat for me in and of itself. Just recently moved to Tucson, Arizona from Texas. Decided that the new life needed a new area as well! I'm currently working as an RN in an ER out here and loving every minute of it. I love people's reactions when they discover what my life used to be like — they can hardly believe pictures when they see them!" "Me crossing into my new state! Here's to new life experiences!" Sarah, thank you so much for sharing your incredible story with us! You are an inspiration. Good luck in Arizona!